NASA's humanoid robot astronaut is getting its space legs. 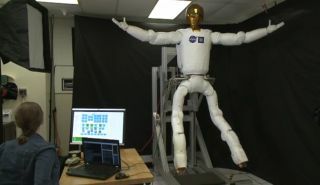 The space agency is building lower limbs for Robonaut 2, a robot designed to eventually help astronauts by taking over some of their duties on the International Space Station. R2, as NASA calls it, is currently legless with its torso attached to a support post in the orbiting outpost. A new NASA video of Robonaut 2 with legs shows the strange ways the robotic limbs can move. "NASA has explored with robots for more than a decade, from the stalwart rovers on Mars to R2 on the station," Michael Gazarik, NASA's associate administrator for space technology, said in a statement on Dec. 9. "Our investment in robotic technology development is helping us to bolster productivity by applying robotics technology and devices to fortify and enhance individual human capabilities, performance and safety in space." The legs themselves aren't anything like human limbs. Once attached to Robonaut 2's 3 foot 4 inch torso (1.01 meters), the robot's leg span will be 9 feet (2.7 meters). This image shows NASA’s Robonaut 2 with newly developed climbing legs, designed to give the robot mobility in zero gravity. With legs, Robonaut 2 will be able to assist astronauts with both hands while keeping at least one leg anchored to the station structure at all times. Image released Nov. 13, 2013. Robonaut 2's robotic legs have seven joints and a special tool called an "end effector" takes the place of feet. The tool will let R2 use sockets and handrails to move about in and outside the station, but R2's upper body requires upgrades before it can venture outside into the vacuum of space, according to NASA officials. "Technologies developed for Robonaut have led to new robotic devices for future spaceflight that also have direct applications here on Earth," NASA officials said in a news release. "For example, NASA is developing a robotic exoskeleton that could help astronauts stay healthier in space and also aid people with physical disabilities." NASA is planning to debut R5, its next robot in the Robonaut series, later in December. R5 will compete in DARPA's Robotics Challenge where robots will be tested in dangerous, human created environments, NASA officials said. The $2.5 million Robonaut 2 arrived on the space station in 2011 during the last flight of the space shuttle Discovery. NASA also has a twin robot used for Robonaut testing on Earth.